I had a surprise pregnancy at the age of 40. We got another surprise at 11 weeks gestation when we found out our baby had a 1 in 5 chance of having Down syndrome. We walked into our OB’s office after receiving the news and she asked us when we wanted to scheduled the termination. After telling her that we would not be terminating the pregnancy she tried to convince us that it would be “right” thing to do. She went on to tell us that our baby would be a hardship on our family and a burden to society. We walked out of her office and never went back. Time went on and there were more complications. We were assigned to a team of perinatologists for my high risk pregnancy. At 16 weeks gestation we had an amnio and found out that our baby was a girl and the diagnosis of Down syndrome was confirmed. We had already decided that if we were having a boy he would be named after my husband and his father, and if we were having a girl she would be named after my mother. So “the baby” became Lila, and she began to grow even more in our hearts. Lila had a lot going on! She had a heart defect (VSD), an issue with her kidneys, IUGR, duodenal atresia, the list seemed to go on and on. At around 27 weeks gestation, after being a VERY active baby, Lila stopped moving. We made an appointment to have an ultrasound. Our amazing doctor told us that we needed to prepare to say goodbye~ that there was nothing he could do and it was all in God’s hands. He said if it was a healthy pregnancy that he would recommend an emergency c section but that wasn’t the best option for us. He told us how sorry he was and hugged me as I cried. My husband and I left his office, sat in the parking lot, and cried together. We called our parents and told them what the doctor said. I will never forget what my mom said in that parking lot. She said, “The doctor is wrong. She is going to live- I had a dream that I was changing her diaper at your house!” That may seem weird to other people but when my mom says something like that, we listen. It gave us so much hope. Two days later our little fighter started moving again. Fast forward through a bunch of appointments, a surgery consult, NICU tours, hospital triage visits and one hospital stay, Lila was born at 35 weeks gestation via emergency c-section. She weighed in at 5 pounds, 5 ounces. There was an entire team from the NICU in the room and they took her away immediately. Lila had surgery within 24 hours of her birth to correct duodenal atresia. Back into the NICU she went, and there she stayed until she was 7 1/2 weeks old. The day we brought her home is a day I will never forget. 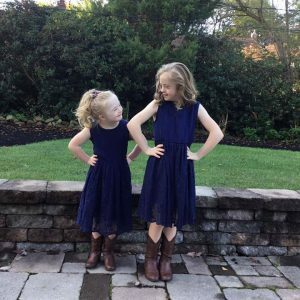 Shortly after Lila began receiving IVIG treatments, I saw a Facebook post that would change our lives forever. A baby girl with Down syndrome needed a forever family. I saw those posts quite frequently and since none of them applied to me (or so I thought at the time) I just kept scrolling. A week later I was still thinking about that Facebook post. That baby girl. I called my husband and we decided it would be ok for me to call and ask some questions. “I just want to make sure they found a family for her.” That call turned into more calls and a couple of weeks later I was on the phone with the birth mother of that precious baby girl. A few weeks after that, the birth parents and the baby visited our home. . A couple of weeks after that, we received the call that we had been chosen as the baby’s forever family. 12 days later, we brought that baby girl home and changed her name to Lexi. There are many details missing from the story I just told. Some things are just too private and too sacred to be shared publicly. If we are ever in the same room, ask us about the story. We both love telling the story of how Lexi joined our family, and how she was meant to be ours. Lexi was born on my son and daughter-in-law’s wedding day. Not just on the same day, but during the time the ceremony was taking place. Our family gained two new members that day, we just didn’t know about one of them until later. 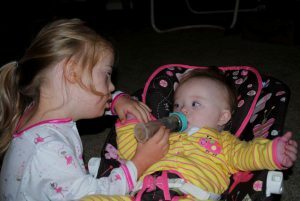 Lila and Lexi seemed to bond immediately. We are so incredibly thankful for that.. Lexi wasn’t too sure about the adults in the house but she sure liked Lila and the feeling was mutual. Lila is 11 years old and in the 5th grade. She now receives weekly Hzentra (subcutaneous) treatments for her immune deficiency. Lila loves to read, sing, dance, listen to music and Facetime her big sister. She loves animals and loves to learn everything she can about them. When she grows up she wants to work at a veterinary hospital, zoo or aquarium. Lexi is currently 7 years old and in the 1st grade. Lexi is a healthy little girl who is full of life. She never meets a stranger and loves to learn everything she can about everyone around her. Lexi loves to write, color, dance and practice “flips” which nearly give her parents panic attacks. When she grows up she wants to be a Super Hero. Lila and Lexi are best friends. They fight like all siblings do but they love each other fiercely. We are so incredibly grateful that they have each other. About the Author: Linda Nargi lives in Wilmington, DE with her husband Nick and their daughters, Lila and Lexi. She also has grown children- her daughter Tiffani lives in Colorado. Her son Justin lives in Virginia with his wife and daughter. 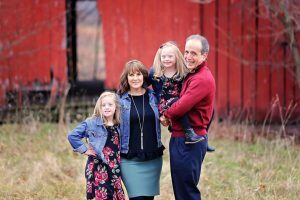 Linda is a stay at home mom who devotes her spare time to learning all that she can to passionately advocate for her daughters with Down syndrome and all individuals with disabilities.